As an internet business owner or marketer, you need to be aware of what transactional emails are and how they can impact your promotion efforts in a major way. In fact, if you have customers with whom you regularly interact through email (who doesn’t?) 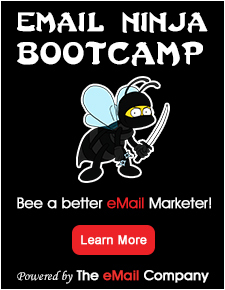 then you’re already using transactional emails on a regular basis. What are transactional messages? Quite simply, they’re all those one-at-a-time email messages that get sent to your website customers or app users when they interact with either platform on some level. Transactional emails can include billing invoices, shipping notices, welcome emails, comment notifications and renewal requests, just to name a few examples. The key qualities that all transactional messages have in common are: 1) they must be relevant to a specific transaction or interaction their recipient has had with your website/app and 2) they are not regularly bulk mailed the way promotional emails are. What makes transactional emails so powerful is the fact that they have been statistically shown to garner incredibly high open rates and unique clicks. Just take a look at this researched infographic by the people at the email management service Easy SMTP to see what kind of open rates I’m talking about. On average, over 191 billion emails get sent out every day to inboxes worldwide. This amounts to roughly 48 emails per inbox. More than half of these are business or promotion-related messages. With numbers like these, it’s easy to see why any email marketing campaign and its associated mail-outs will have a hard time capturing eyeballs consistently and with high percentages. This is where transactional messages can take up the slack incredibly. According to client email tracking done for the Easy SMTP infographic, transactional messages sent out to user inboxes enjoy open rates that can go above 100% (due to multiple openings by the same recipient) and unique click rates of more than 17%! In contrast, most bulk email campaigns only receive open rates of just 15% and clickthrough rates of a measly 3%. Because of their direct relevance to recent activity by their recipient, transactional messages are much more interesting to your users and are thus far more likely to get noticed and opened. This is where you can step in and take even further advantage of these messages that you’re already sending out regularly. For starters, make your transactional messages more interesting. Use varied templates that clearly show off your brand image and A/B test different email formats to see which ones work better at creating increased conversions. This will create a better visual experience for your users and a more memorable viewing experience. Furthermore, increase audience exposure to your transactional messages by serializing them as much as reasonably possible into a larger set of smaller emails. For example, break down your welcome messages into two or more parts by including a different transactional component in each. Doing this has been shown to boost revenue by 13% or more. Create a social media sharing opportunity for your email recipients by adding links or buttons to your business social pages (Twitter, Facebook, Instagram, etc) right inside your emails. Tailor the social media platforms you use based on your audience type and business model. This step was shown by Easy SMTP to boost unique clicks by as much as 55%. Personalize your transactional emails and use them to cross-sell by referring to the specific identifying details for each individual client/user. Include recipients’ names in your email message and where possible (such as with sales invoice emails) make further suggestions for new products or services based on how they complement previous purchases. Personalizing and cross-selling techniques have been shown to boost unique clicks by 41% or more and revenues by more than 20% respectively. Finally, learn to say “thank you” in your emails. If you send a customer a shipping invoice, welcome email or renewal notice, thank them clearly in your email subject line and message body. Even something as simple as this can boost open and click rates by more than 35%! 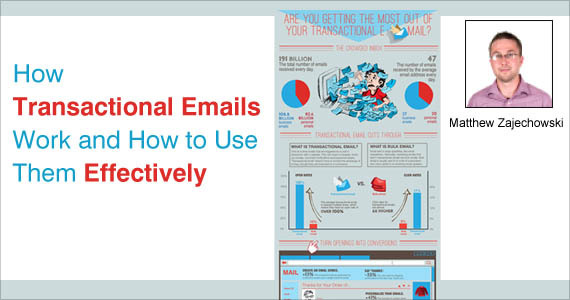 Takeaway: In summary, transactional emails can be powerful tools for business owners and marketers if used effectively. 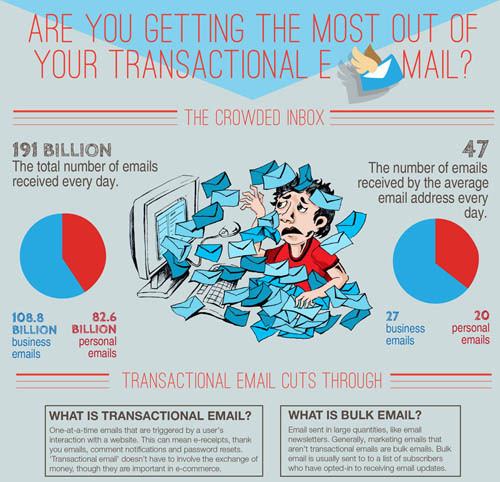 To get the most of out your transactional emails simply follow the steps outlined in the infographic from Easy SMTP and the steps outlined above.